TORONTO , Oct.1, 2018 /CNW/ - Continental Gold Inc. (TSX:CNL; OTCQX:CGOOF) ("Continental" or the "Company") announces additional high-grade assay results from 11 holes drilled into the Yaraguá system as part of its 2018 exploration drilling and underground channel sampling program at its 100%-owned Buriticá project in Antioquia, Colombia . Ari Sussman , CEO of Continental Gold, stated: "Continental's most important and cherished resource is our people. Our hearts are heavy from the recent tragedies and we are in the process of taking the necessary measures to take care of our employees and their families. We are grateful for the enormous outpouring of support from the communities and from all levels of government, Colombians in general and our shareholders. Together, we will come through this process strengthened as a team. We will continue to build Colombia´s most modern mine in Buriticá, which will become an important economic and social contributor to an undeveloped region of the country. While we have temporarily halted exploration activities in projects outside of Buriticá, we continue to work for all our employees and shareholders by looking after the Company's second most precious resource: our Buriticá deposit." The Company presently has 11 diamond drill rigs in operation; two rigs are being utilized for the recently-started stope definition drilling program, seven rigs are conducting infill and resource expansion drilling at the Yaraguá and Veta Sur deposits and two rigs are testing the Laurel and Perseus greenfield targets. "Our Buriticá project has delivered remarkable results and the correlation between increased sample density and improved grades X widths continues to be robust," Mr. Sussman added. " The discovery of a new broad mineralized zone (BMZ) is motivating, as its location is central to planned underground mine development for the Yaraguá deposit and could be accessed in the first year of mining for the project. We are focused on discovering and defining BMZs as they could reduce start-up risks for the project, expedite the production ramp up from 2,100 to 3,000 tonnes per day as outlined in the feasibility study and eventually allow for production throughput to increase past 3,000 tonnes per day." "Additionally, underground development at our Veta Sur deposit has advanced rapidly and, as a result, we have begun drilling the BMZ5 target (located in the centre of the Veta system) ahead of schedule. We anticipate first results from this drilling over the coming weeks and are optimistic about the potential from this zone." Drilling has increased the vertical extent of BMZ1 in the Yaraguá system by more than 130% and now measures 360 metres vertically. The zone remains wide open in high grades at depth for expansion. BMZ1, which our exploration team initially thought would be cut-off by the Diatreme Fault at 1,325 RL, has re-emerged in subsequent drill holes drilled approximately 15 metres below the fault with thicknesses and gold grades increasing as drill holes move further away from the fault at depth. Additional drilling is planned in the near term to test the vertical potential of this new zone as it is ideally located within the Yaraguá system to be mined at the beginning of planned commercial start-up in 2020. (2) Channel chip samples are taken continuously along the walls of the underground cross-cuts and across the face of the underground drifts. Faces are nominally spaced every 3 metres along the drift and face composites average six length-weighted channel samples. Widths are true horizontal metres at 0 g/t gold grade cut-off. Stope definition drilling will begin in early October on this section and in BMZ1. The BMZ consists of a group of modelled precious metal-bearing veins in the current mineral resource estimate block model with mineralization occurring between these veins, generally in the form of veinlets at oblique angles to strike. The majority of the mineralization between modelled veins is not in the current mineral resource estimate, providing potential upside both in terms of identifying significantly broader and more productive zones for mining and increased mineral resources. To date, the Company has identified up to seven BMZs for testing and will systematically drill each target zone as underground mine development advances. BMZ1 encompasses a matrix of the east-west trending FW, San Antonio and HW veins as well as a package of a NW-SE vein and subsidiary veinlets. Continental's 100%-owned, 75,023-hectare project, Buriticá, contains several known areas of high-grade gold and silver mineralization, of base metal carbonate-style ("Stage I") variably overprinted by texturally and chemically distinctive high-grade ("Stage II") mineralization. The two most extensively explored of these areas (the Yaraguá and Veta Sur systems) are central to this land package. The Yaraguá system has been drill-outlined along 1,100 metres of strike and 1,700 vertical metres and partially sampled in underground developments. The Veta Sur system has been drill-outlined along 1,000+ metres of strike and 1,800 vertical metres and has been partially sampled in underground developments. Both systems are characterized by multiple, steeply-dipping veins and broader, more disseminated mineralization and both remain open at depth and along strike, at high grades. 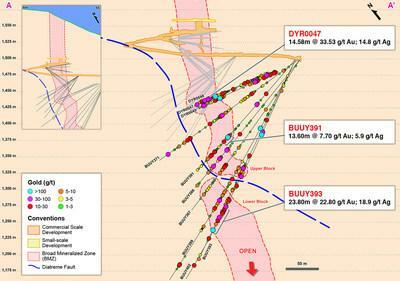 Underground development along the veins was sampled by trained crews under the direct supervision of mine geologists. The sampling consisted of channel samples that were taken by hammer and chisel across the full width of the face every 3 metres along strike. Distinct geological zones were sampled separately (vein separate from wall rock), with minimum-maximum horizontal sample widths of 0.2 to 1.0 metres. The widths of the channels were adjusted so that each sample weighed between approximately 2 to 8 kilograms. Sample locations were measured from a surveyed control point. Duplicate channel samples were collected with a frequency of one every 25 samples. Bar code tags were inserted into the individual sample bags by the geologist, including duplicates which were numbered in sequence with the primary samples. The bags were then secured with a cable tie and transported out of the mine by the sampling crew to a secure staging area on surface using a procedure supervised by the Mine Geologist and Chief Geologist. Channel samples were prepared and analyzed at Continental's Yaraguá mine laboratory at Buriticá, Colombia . Blanks, field duplicates from each heading, pulp duplicates, check assays and analysis of results using industry-accepted best practices and certified reference standards are inserted into the sample stream to monitor laboratory performance. Channel samples were analyzed using a 50-gram gold fire assay with gravimetric finish. All silver values were determined by four acids digestion and atomic absorption method. For information on the Buriticá project, please refer to the technical report, prepared in accordance with NI 43-101, entitled "Buriticá Project NI 43-101 Technical Report Feasibility Study, Antioquia, Colombia " and dated March 29, 2016 with an effective date of February 24, 2016 , led by independent consultants JDS Energy & Mining Inc. The technical report is available on SEDAR at www.sedar.com, on the OTCQX at www.otcmarkets.com and on the Company website at www.continentalgold.com. This press release contains or refers to forward-looking information under Canadian securities legislation, including statements regarding timing of drill results and commercial production, advancing the Buriticá project, exploration results, potential mineralization, potential development of mine openings, potential improvement of mining dilution grades, reducing start-up risks, increase in production throughput and exploration and mine development plans, and is based on current expectations that involve a number of significant business risks and uncertainties. Forward-looking statements are subject to other factors that could cause actual results to differ materially from expected results. Readers should not place undue reliance on forward-looking statements. Factors that could cause actual results to differ materially from any forward-looking statement include, but are not limited to, an inability to advance the Buriticá project to the next level, failure to convert estimated mineral resources to reserves, capital and operating costs varying significantly from estimates, the preliminary nature of metallurgical test results, delays in obtaining or failures to obtain required governmental, environmental or other project approvals, political risks, uncertainties relating to the availability and costs of financing needed in the future, changes in equity markets, inflation, changes in exchange rates, fluctuations in commodity prices, delays in the development of projects and the other risks involved in the mineral exploration and development industry. Specific reference is made to the most recent Annual Information Form on file with Canadian provincial securities regulatory authorities for a discussion of some of the factors underlying forward-looking statements. All the forward-looking statements made in this press release are qualified by these cautionary statements and are made as of the date hereof. The Company assumes no responsibility to update them or revise them to reflect new events or circumstances other than as required by law. This press release was prepared in accordance with Canadian standards, which differ in some respects from United States standards. In particular, and without limiting the generality of the foregoing, the terms "inferred mineral resources," "indicated mineral resources," "measured mineral resources" and "mineral resources" that may be used or referenced in this press release are Canadian mining terms as defined in accordance with National Instrument 43-101 – Standards of Disclosure for Mineral Projects under the guidelines set out in the Canadian Institute of Mining, Metallurgy and Petroleum (the "CIM") Standards on Mineral Resources and Mineral Reserves (the "CIM Standards"). The CIM Standards differ significantly from standards in the United States . While the terms "mineral resource," "measured mineral resources," "indicated mineral resources," and "inferred mineral resources" are recognized and required by Canadian regulations, they are not defined terms under standards in the United States . "Inferred mineral resources" have a great amount of uncertainty as to their existence, and great uncertainty as to their economic and legal feasibility. It cannot be assumed that all or any part of an inferred mineral resource will ever be upgraded to a higher category. Under Canadian securities laws, estimates of inferred mineral resources may not form the basis of feasibility or other economic studies. Readers are cautioned not to assume that all or any part of measured or indicated mineral resources will ever be converted into reserves. Readers are also cautioned not to assume that all or any part of an inferred mineral resource exists or is economically or legally mineable. Disclosure of "contained ounces" in a resource is permitted disclosure under Canadian regulations; however, United States companies are only permitted to report mineralization that does not constitute "reserves" by standards in the United States as in place tonnage and grade without reference to unit measures. Accordingly, information regarding resources contained or referenced in this press release containing descriptions of our mineral deposits may not be comparable to similar information made public by United States companies.